There is a ton of chatter going on about Bitcoin and depending on who you listen to, Bitcoin might be good or bad, easy or hard to use, worthwhile or going to be a bust. Here is a Bitcoin guide for those who are curious about how this new cryptocurrency is bought, sold and used. Bitcoin is supposed to be an entirely anonymous platform – like the way cash works in the physical world. You are supposed to be able to buy and sell things on digital platforms without financial details and records being exchanged. But a Bitcoin wallet doesn’t come with any kind of government guarantees. So, if Coinbase goes under or your Bitcoin is lost or stolen the consumer has very little recourse – meaning you will probably never get your money back. But you don’t have to buy whole Bitcoins. Just like you can use a fraction of a dollar – in a penny, nickel, dime or quarter – you can use and buy fractions of Bitcoins. The smallest fraction that can currently be bought or sent is a one-hundred-millionth of a Bitcoin – this is called a Satoshi – after the mysterious founder of the cryptocurrency. You can purchase Bitcoin directly through your Coinbase account in whatever fraction or whole amounts you choose. Coinbase charges a small bank transfer fee and a 1% fee on your purchase, so be sure to take that into consideration when you buy. 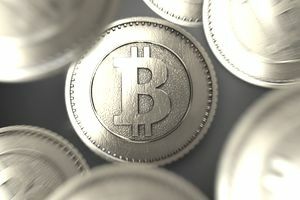 There are a limited amount of retailers that take Bitcoin in exchange for goods and services, but unlike its reputation, they are often regular run of the mill companies and not black market operations. Currently, some Shopify store owners (under a variety of brands) will take Bitcoin, so does Overstock.com and Newegg. There are others as well, but it’s a really hit or miss scenario. If a store takes Bitcoin you can use it just like a credit card to pay for products and services. Because Bitcoin exists mostly outside of government regulation it does pose more risk than dealing with banks and government currency. However, it’s not hard to buy or sell – although the value of a Bitcoin can fluctuate wildly. You can also use Bitcoin to make a limited amount of purchases – mostly on the web. If you decide to dabble in Bitcoin, it’s important to know that you can lose money if the value drops and that it’s still a very new technology and even the best futurists aren’t sure what’s going to happen with it. So, it’s a good idea to use the philosophy “buyer beware” when it comes to Bitcoin.